Audra Jennings: Need help with your "Brady Bunch"? Ray Alsdorf recently retired from law enforcement after 37 years. For the past 22 years he served as a detective/inspector for the Alameda County District Attorney specializing in welfare fraud, child endangerment, and other abuses. He is a Biblical lay-counselor, a member of AACC, and serves in the New Hope Ministry team at his local church. He currently counsels couples in blended marriages or those who are considering remarriage. He and his wife, Debbie, teach blended family classes at Cornerstone Fellowship. Debbie Alsdorf has served as the director of Women’s Ministries at Cornerstone Fellowship for the past 13 years. She is a teaching leader, a mentor to other women in leadership, and equips and trains about 200 key women’s ministry leaders each month. In addition, she serves as a Biblical lay-counselor and is a member of AACC. In addition to her position at Cornerstone, she is also an international speaker and author and the founder of Design4Living Ministries—a ministry to equip and encourage women in their spiritual walks by providing resources that help them learn truth and line up to Biblical truth in the practical places of real life. White lace and promises, a kiss for luck and we’re on our way. “You have gotta be kidding me!” I was in disbelief after reading the new court papers served to my husband. We were only two weeks into our new marriage when reality hit us. Before we had opened every wedding gift, we were opening the gift that would keep on giving—the aftermath of divorce and remarriage. I suspected that Ray’s ex-wife filed the new custody papers because my little boys were now living under Ray’s roof and sharing the girls’ turf. Add to the equation the fact that another woman was in their life, and you have the recipe for blended-family wars. What once seemed smooth was now turning into a full-force battle. It was hard not to take this slap in our faces personally. My mind raced through anger, frustration, and guilt. Anger that someone else now seemed to have control over my daily life, my finances, and my husband’s future—and frustration that our dream of uniting our two families as one was being dashed right before our eyes. I went from blushing bride to the wicked stepmother in record speed. The guilt associated with being the one who was apparently the problem was almost more than I could bear. The guilt made no logical sense, because Ray had been divorced several years before meeting me, but if Ray hadn’t married me, his custody arrangement would have stayed the same. Watching him fight for his girls broke my heart. This was our new life—not exactly what we had in mind. From the beginning of my new life in a blended family, rejection and hurt became part of the routine of my existence. I did not like my new reality. I kept wishing I could turn back the clock to a time when everything seemed to have the promise of happily ever after—a time when everything seemed so perfect. Most single parents I meet have the dream of meeting another love and living happily ever after. And, according to statistics, most adults do remarry after being widowed or divorced. But the sad fact is that approximately 70 percent of remarriages that involve children are failing. We think it’s time to get real about the dream of happily-ever-after-times-two and relinquish it—to the Lord. He can give us what we need to live in a life that is no longer typical, in a family that is not “ordinary,” and in a world where our nuclear ideas of family have been blown apart by the reality that our blended families barely resemble a blend! Our dream wasn’t supposed to be filled with anger, hurt feelings, court cases, and costly attorneys. We started out with white lace and promises. It was a beautiful August day—the pale blue sky spread like a blanket with polka dots of white clouds. The morning was picturesque, the perfect day for a wedding—anyone’s wedding—but this day was reserved just for us. Everything was perfect. As the limo made its way to the church, I (Debbie) felt far removed from the bustle of life just down the hill and far removed from the pain of my past. This was my new happy ending—this was the day when I had a second chance at love. It was a day to redeem the dream destroyed by an unwanted divorce. I (Ray) was about as excited as a man can be. After all, I was about to marry the woman of my dreams. As the limo made its way to drop off my groomsmen and me at the church, all I could think of was how blessed I was to have met this wonderful woman. I was excited about our future together. I was marrying a woman I had fallen madly in love with. Our courtship was something movies are made of. Debbie was the answer to my four-year prayer that God would bless me with a godly wife. Our new life together included four children, all within a fouryear age range—two in first grade, one in second grade, and the oldest in fourth grade. I (Ray) had the girls and Debbie had the boys. Together we were all going to be the new little family—a real-life Brady Bunch. The girls looked like little dolls, with curly hair, fancy satin dresses, and shoes right out of a fairy tale. The boys looked like little men with their pint-sized tuxedos, a splash of men’s cologne, and spiffed-up hair. After running about the building and doing the silly things kids do, they took their cue from the wedding coordinator and walked down the aisle to the delight of our guests. Once in their places, they waited with the bridesmaids and groomsmen for the wedding to begin. So far, the day was picture perfect. Most brides are nervous on their wedding day, and I (Debbie) was about as nervous as any bride could be. I stood by the double doors of the church, my heart pounding. As the doors opened and the guests rose, I made my entrance down the center aisle, gazing at my handsome new prince waiting for me at the end of a rose-petaled path. For a moment I felt like Cinderella. My prince’s smile melted me, and it was all I could do to keep myself from running toward him and the kids. It was a moment I will never forget—a romantic snapshot etched in my memory. After we said, “I do,” we spontaneously gave each other an unrehearsed high five! Our guests laughed. We were going to make it—Ray and Debbie were starting their new life together. We would never have believed that just a short time later, in the heat of a custody battle, we would seriously doubt the vows we made on that picture-perfect wedding day. At our reception, the new brothers and sisters entertained the guests by singing the Brady Bunch song. We all smiled, chuckled, and applauded. Ray and I felt a flush of parental pride rush through us. Oh, how adorable we all were on that day—Mr. and Mrs. Blend and the little Blends. We assumed that life would continue down this delightful path. In record speed, the darling rendition of the Brady Bunch song was replaced by the sound of kids fighting, competing, and trying as hard as they could to position themselves in the new family. And we found ourselves in constant squabbles over the territorial rights of our own children. Add to that the ex-spouse dramas, and let’s just say our life was quickly becoming more than hard. We were suddenly face-to-face with an enemy we were ill-equipped to fight. Life was about to become more challenging than we ever thought possible. 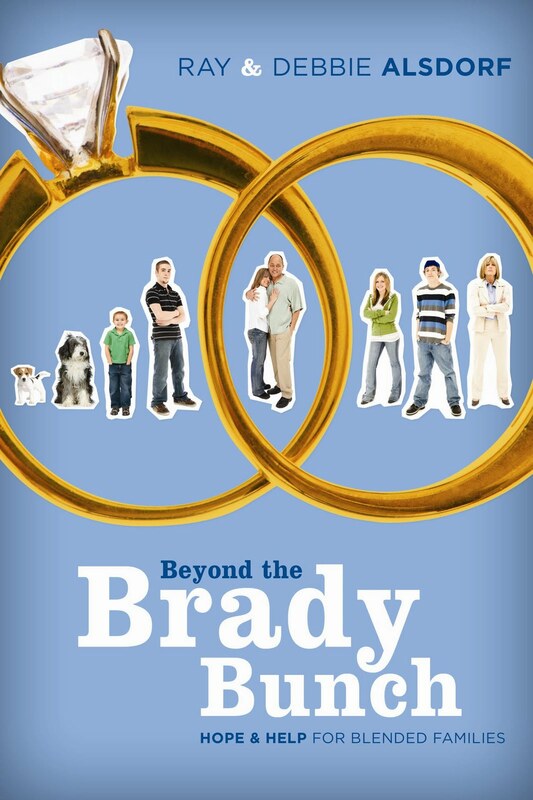 Instead of a glorious new life, we quickly learned that the Bradys don’t exist in the real world—only in a Hollywood studio. I can’t recall a television episode where a stepchild or an ex-spouse treated Mr. Brady unfairly. I never saw a show with a court-custody scene featuring Mr. and Mrs. Brady fighting the past to hold on to their future. There was never mention of strained finances, bad relationships, or past hurts. And Mr. Brady never mentioned a husband-in-law, nor did Mrs. Brady have to deal with the ghost of a wife past, even though both are common in blended families. We have counseled many couples in blended families, as well as taught blended-family classes at our local church. The thing that gets to us the most is the amount of pain people are in. The pain level in some of our classes is almost palpable. Sadly, most couples usually call us before they hit the threemonth mark. By that time, the realities of life in the blender have begun to rear their ugly heads. What couples can’t accept are the same things we found hard to accept—once you say, “I do,” things change. Shortly after we tied the knot, everything became real to all involved—and the children, who seemed excited that we were getting married, began their individual struggles to adapt. It’s such a strange contradiction of emotion—on one hand, the new husband and wife are in love and happy to start a life together, but on the other hand, they see the children beginning to show signs of strain and unhappiness. The duality of this family structure can quickly get things off balance. It became apparent that our new life would be a long, hard journey of two families trying to merge as one. Our union began to seem more like a collision course than a merge, and emotions were set to boil rather than blend. We had hoped that if we tried hard enough and did it “right,” we could overcome any adversity our blended family faced. After all, we were “in love.” Maybe you have felt the same. Remember the children’s classic The Little Engine That Could? The story gives hope that, with enough hard work and optimism, anything can be accomplished. As the little engine chugs along with, “I think I can, I think I can, I think I can.…” it makes its way up even the most daunting hill. Certainly anyone in a blended family can relate to hoping for the future while muttering, “I can do this, I can do this, I can do this.…” But once we walk down the aisle, the powers of hell are determined to see us fail. And when that happens, we all need someone bigger and more powerful than ourselves. We need the help and hope that only God, who created us all and understands us all, can give. Marci and Mike had the perfect life in mind too. They had been married just a few months when problems started to erupt. Actually, they started bubbling earlier, but they took time to come to a full boil. When they married, Mike was forty and had joint custody of his eight-year-old daughter. Marci was thirty-nine with two children—a ten-year-old daughter and a seven-year-old son—and full custody. and her children. Mike argued that it simply was not true, that his only “baby” was everything to him, his heartbeat—but his exwife now felt threatened, and she pulled out all the stops to make things difficult. Naturally, Mom’s feelings transferred to Mike’s daughter. The girl began to refuse to go over to her dad’s new house—because she suddenly didn’t like Marci and her two kids. Mike was devastated. His new life was not supposed to turn out this way. They had planned to be one big happy family. But before long, both Marci and Mike started being territorial and protective of their own children. Both were deadlocked in a competition to protect their turf—the children from their respective previous marriages. Steeped in pride and unwilling to let go, Marci and Mike almost brought their marriage to a devastating halt. How could this be? They had been so in love, and the children had gotten along perfectly during the courtship. Did some evil switch get flipped? Was this a cruel joke of fate? Would they survive? Why was the real life after the wedding so hard? Blending isn’t natural and is a challenge for all involved. Mike and Marci found that there was an unanticipated competition based on biological family ties. This competition is normal, but because it was unanticipated it seemed much worse than it really was. Ex-spouses often feel threatened once there is a remarriage and may work very hard to sabotage the children’s relationship with both the biological parent and the new stepparent. There would be hurdles to jump and new things to consider, but if Marci and Mike put their heads in the sand (denial) or hardened their hearts (bitterness) toward to each other, or toward anyone in their extended family circle, family devastation would follow. If they asked for God’s help, He would give it. He would answer in spiritual ways that would affect all practical decisions. In Christ, all things are possible—even love in a blended family. Marci and Mike needed to get real, admitting to themselves and each other that this was harder than they thought it was going to be. It was important to quit trying to “play” family; it was time to turn their hearts to God so that a proper foundation for their new family could be established. Without this reality check and the desire for a proper solid foundation, everything else would continue to fall short of what the couple was looking for. Maybe you can see parts of your dynamics within Mike and Marci’s story. Though life didn’t end up exactly how they dreamed it would, there were many practical things they could begin doing. Let’s use them as a case study and discover how what they could do differently applies to us as well. trying to do all things together, involving both his daughter and his stepchildren. His daughter needed to know she had her daddy still and his love always. This alone time would help strengthen their relationship and negate the things her mom was saying about Daddy not caring about her as much as he cared for Marci’s kids. • Both Mike and Marci needed to build alone time with their children into their schedules and not feel guilty about it. In time, after things had blended better, Marci could take Mike’s daughter for alone time and vice versa. • Mike and Marci also needed to look for ways to make peace with his ex-wife. Meetings often don’t resolve things, because there is unspoken underlying hurt involved. They needed to start praying for her weekly and to find things that might bless her. • If Mike’s ex-wife was not open to negotiation, they needed to leave her be and continue committing the situation to God and doing what they knew to be right. They needed to refuse to play her game, choose to bless her, and continue to make Mike’s daughter feel part of the family in tangible ways. Because life will not feel normal and will be difficult in the adjustment phase, you will face emotional changes and challenges that you need to keep in check. Find a way to cope with your emotions—get counseling, join a support group, or talk to friends. Make sure you don’t confide in your child about all of your feelings. Rather than confiding adult things to your child, make time for your child and continue to build a relationship with him or her. Make sure you keep your word and are on time when you have a parent-child date. Continue living life; maintain your job, friendships, and schedules. Most of all, stay connected to Christ. When we humble ourselves before God, He begins to do a work in us. But humbling your heart before God is not a quick fix. Blending still takes time. Guess we better get our space suits on and figure out how to walk on the moon! Or at the very least, we need to reidentify who we are now—not who we were, or who we dreamed we’d be, but who we are today. • Has blending your family turned out to be harder than you anticipated? If so, how? • Have you asked for God’s help, or are you trying to figure life in the blended family out on your own? • What choice do your actions demonstrate? • Are you holding on to His promise of healing your family? If so, what specific promises are most important to you? • Or, as we did at first, are you trying to do this with your own strength, goodwill, kind heart, and fairy-tale hopes of a better tomorrow? If so, how effective has that been so far? Why? that God has called us to be peacemakers.